The 2019 Jacobsen Middle School track and field team. Jacobsen's Quincey Whiting and Austin DeGerolami compete in the 800m. Iven Sandholt competes in the long jump for Jacobsen Middle School. We took 48 athletes to the meet, and considering we’ve been battling the elements and many sicknesses, the athletes did quite well. These are just a few of the highlights from the meet. In our intermediate age group, we have several standouts; Alexis Delano took 1st in both the discus and the shot put. Alyssa Mesa took 1st in the long jump and 2nd in discus. Iven Sandholdt took 1st in the 100m, high jump and triple jump. Mason Holden took 3rd place in the discus and the long jump. 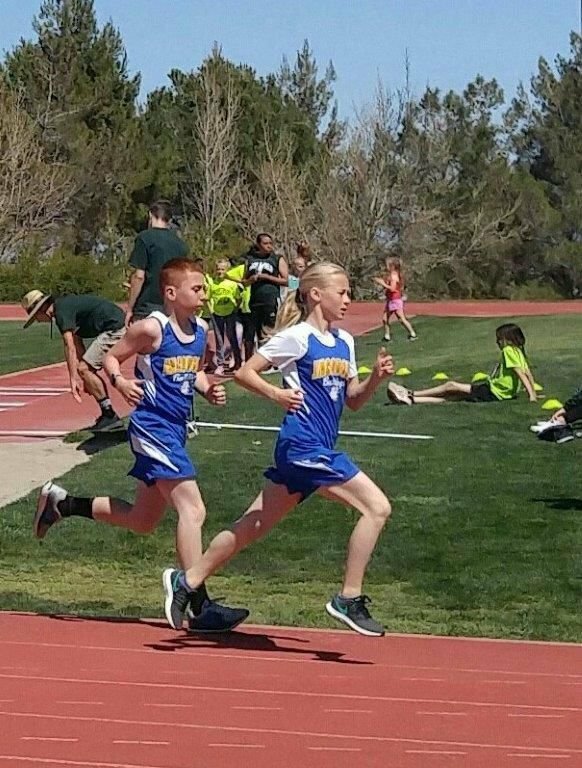 In our youth age group, we had both our boys and girls 4x100m relays qualify in 1st place. These teams included Anaiyah Bryant, Ivie Billings, Iliana Aviles and Claire Shadduck. The boys were Jacob Betancourt, Ryan Wilson, Christian Morse and Cameron Van Ostrand. Also in this age group, Liam Willey took 1st and 2nd in the discus and shot put, with Christian Morse taking 1st in the shot put. Cameron Van Ostrand took 1st in the 100m, and Kaleb Songer took 3rd in the 100m and 2nd in the 200m. Quincey Whiting took 1st place in both the 1500m and the 800m races. Averee Napier took 2nd in the 3,000m. We had boys and girls qualify in the 100m hurdles with Isaac Perry taking 1st and Christian Morse taking 2nd, and Anaiyah Bryant taking 2nd. In our midget age group we had Amelia Webb taking 1st place in both the long jump and the high jump. Carlee Henser took 2nd in the high jump; Grant Warner took 1st in the boys high jump. We also had Priscilla Robb talking 3rd place in the 200m. Overall, it was a very good day. We have 28 athletes moving on to the next meet, the Northern Section Meet, at Liberty. The coaches and athletes would like to thank Kenny Harrison and the P-Dubs family for sponsoring our team, and purchasing our new uniforms for us. Thank you! We really appreciate your dedication to the kids of Tehachapi! Amy Lang coaches the JMS track and field team.